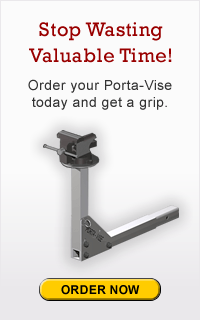 Constructed of aerospace grade square tube aluminum, the Porta-Vise weighs in at a minimal 15lbs, but has the strength to withstand massive amounts of weight and pressure. The upper arm is designed to provide the perfect clearance to use the tailgate as a workbench, fitting all models of small, medium and large size trucks and SUVs. When in use, the upper arm articulates up to lock in place at a 90 degree angle. A removable top cap fits on top of the upper arm. This is designed so a 4.5” bench vise can be attached to the top cap with pre-drilled holes. When not in use the top cap should be removed. The vise or other tool attached is then safely stored to protect it from theft or weathering. The upper arm folds down and then pinned in place. 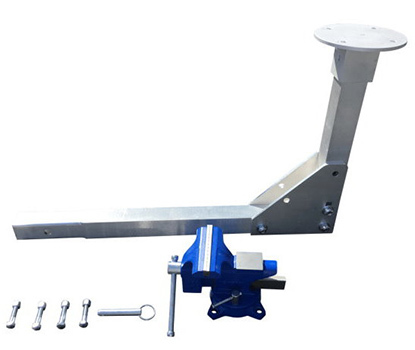 The entire PortA-Vise is simply removed from the receiver hitch and stored safely away from the elements. The top cap is not limited to just the bench vise. A multiple array of tools can be attached including a chain vise, table top, and just about anything you can imagine. Simply modify the top cap to fit the tools you need. Back in 2012, a professional landscaper grew tired of using his knees to hold pipe in place while on the job site. Needing to cut and solder pieces together became dangerous and unreliable trying to use this method. He considered welding a vise to his bumper. But this would have prevented him from ever using his truck bed or tailgate, and he also didn’t want to ruin his bumper. Using the truck bed as a workbench also became cumbersome. He often needed to lay out parts and assemble pipes, manifolds, and sprinkler systems. While the truck bed and tailgate could serve this purpose he knew there had to be a better way. After some trial and error (and visits to the machine shop of a friend) the Porta-Vise was created. In the past three years the response has been overwhelming and immediate.